Ala Littoria was the Italian national airline that operated during the fascist regime in the 1930s and 1940s. 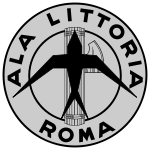 Ala Littoria was formed by a merger of Società Aerea Mediterranea (SAM), Società Anonima Navigazione Aerea (SANA), Società Italiana Servizi Aerei (SISA) and Aero Espresso Italiana (AEI) in 1934. The airline was owned by the Italian government and predominantly featured the Italian flag on its aircraft. After the Spanish Civil War, Ala Littoria invested in Iberia, the Spanish airline that was established following the demise of LAPE. Ala Littoria acquired 12,5 % of the airline and purchased three Junkers Ju 52 air frames without engines from Lufthansa, giving them to Iberia in lieu of capital. Ala Littoria flew to destinations across Europe and Italian colonies in Africa. During the Second World War, Ala Littoria acted as a transport service for the Italian military. However the airline did not survive the war and was disbanded. On 30 April 1938 a Savoia-Marchetti S.73 of Ala Littoria crashed on a flight from Tirana to Rome. The aircraft struck the mountains near Maranola and all nineteen occupants were killed. On 4 December 1939, an Ala Littoria Junkers Ju 52/3mlu flying in bad weather struck a hillside near Bayerisch Eisenstein, Germany, at an altitude of about 1000 meters (3281 feet) during the final leg of a flight from Munich to Berlin and crashed, killing four of the 17 people on board. ↑ Caprotti F (2011) 'Profitability, practicality and ideology: Fascist civil aviation and the short life of Ala Littoria, 1934-1943.' The Journal of Transport History, 32(1), pp.17-38. Wikimedia Commons has media related to Ala Littoria.